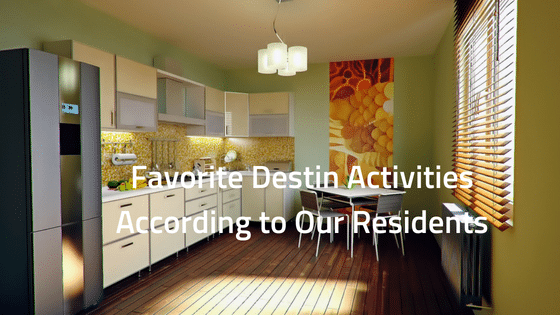 As you’re searching for the perfect Destin apartment for your next move, you might be wondering what activities are available in the area. Fortunately, Destin is a rapidly growing area that offers a wide range of different indoor and outdoor activities for people of all interests. Here are a few of the most recommended options from our residents. While there are numerous golf and country clubs in the area, Emerald Bay offers one of the most beautiful and well-kept courses around. This has long been a favorite of our residents thanks to its proximity and challenging, creative course flow. The whole course was renovated in 2014 with fresh new greens. Naturally, one of Destin’s most popular attractions is the gorgeous harbor and marina. Taking a walk through the harbor will give you plenty of relaxing vibes, or you can chill out and watch the birds, observe the boats, and make sure to take plenty of photographs. Dog lovers can rejoice at Destin’s modern dog park amenities. This location welcomes dogs of all sizes to run off some energy, play with other dogs, and socialize. It is a hot spot in the city where you can meet other like-minded pet lovers and get a little bit of exercise for yourself. The Track is the place to be if you have a family. With go-karts, mini golf and a busy arcade, you can easily while away the weekend hours here. This is a great place to host birthday parties or simply enjoy a fun escape with kids of any age. Plenty of cities have large aquariums, but Destin’s unique Gulfarium features a unique twist. The Gulfarium is a great place to learn about the local streams and waterways by getting up close and personal with all of fish and critters that live in them. You can also enjoy dolphin shows and other presentations along the way. Destin also happens to be home to more than a dozen bars and clubs that are full of action. On any given weekend you can catch live shows, go out dancing, or simply enjoy a cold drink while watching the game on the big screens. There is plenty of variety in the area so it’s easy to find a club you’ll love. Destin is the perfect destination for anyone who wants to enjoy coastal living along with plenty of local attractions and amenities. You can schedule a walkthrough of your next Destin apartment today with Sugarloaf Luxury Apartments. Contact us today for more information!